In which we consider events at the Society of Apothecaries during Sotherton’s reign as Clerk, and record his demise in 1819. Sotherton Backler was elected Clerk to the Worshipful Society of Apothecaries on 15 January 1806, just days after the funeral of Admiral Lord Nelson (see previous blog). In this role he administered the workings of the Society, in particular recording proceedings in his immaculate hand in the Minute Books of the Court of Assistants. His years as Clerk were to be of great importance for the Society. The history of apothecaries as a trade or profession was long one of rivalry between different types of practitioner, ranging from physicians and surgeons to chemists and druggists, and from tradesmen to medical practitioners. The rivalry with the Physicians was resolved at least in law by the case of apothecary William Rose in 1704. The House of Lords over-ruled his conviction for treating a butcher name Searle. This established the right of apothecaries to practice medicine, and changed the role of the Society from one of subservience to the physicians to a more complicated multi-purpose function of both professional and trade regulation, as well as trading in its own right. This dual nature was to persist right through to the Apothecaries Act of 1815. In the period leading up to the passage of the Act, Sotherton, among others, was engaged in considerable negotiation and lobbying. The Society, initially reluctant to accept change, in the end took on the role of formalising a curriculum and overseeing examinations which, along with apprenticeship, attendance at lectures on such topics as anatomy and physiology, and other matters, led to the Licentiateship of the Society of Apothecaries, precursor to what we now know as General Practice. 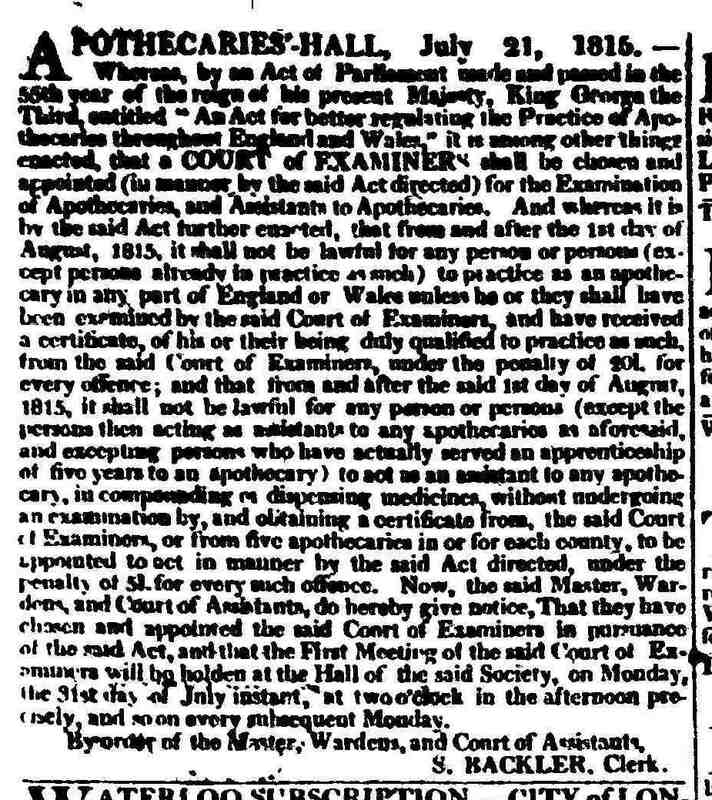 (The extract right from The Times of 21 July 1815, announces the changes which the Act brought.) At the same time, chemists and druggists, who during the latter part of the 18th century had begun to usurp the dispensing role of apothecaries, began to formalise their own training and qualifications, resulting in the establishment of the Pharmaceutical Society of Great Britain in 1841. Despite the formalising of apothecaries’ education and training, a sore point remained their inability to charge for medical advice or attendance – a hangover from earlier days of dispute with the physicians. Apothecaries could only charge for medicines, until a court case in around 1830 ruled that they could also charge for visits and medical advice, thus reducing their previous tendency to over-prescribe medicines in order to cover their costs for practising, in effect, as general practitioners. The Society’s records yield evidence that Sotherton Backler lived at Apothecaries Hall during at least part of his tenure as Clerk. 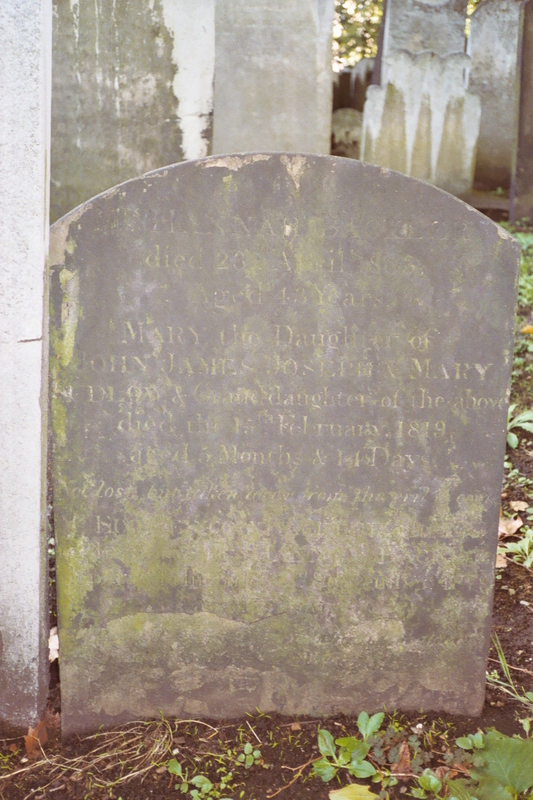 His wife Hannah had died in April 1803, leaving Sotherton with a large number of surviving children presumably still at home. It seems likely that some of the older siblings would have taken charge of the household and care of the family. On 20 March 1807 the Society was in receipt of a letter from the Secretary of the London Bridge Water Works, revealing the discovery by the Collector of the Water Rents that there might be a supply to Apothecaries’ Hall over and above that already known, ‘to the Dwelling House of Mr. Backler, for which he [the rent collector] has received an Annual Payment of £1-8-0…’ The letter asserted that additional water was now found to be supplied to ‘a large Back and two Cisterns’, estimated value of £10 a year. The Board suggested a payment of £200 to cover arrears of water supply for an unknown period! However, by May, it had been decided on further examination that there was no service of water other than to Mr Backler’s house, and there the matter rested, useful indeed in our ascertaining Sotherton Backler’s residence at least at that time. It is presumed that Sotherton then ceased residence at the Society. On 7 January 1817, the Court Minutes noted a payment to S. Backler for coals, of £9 – 14s – 0d. 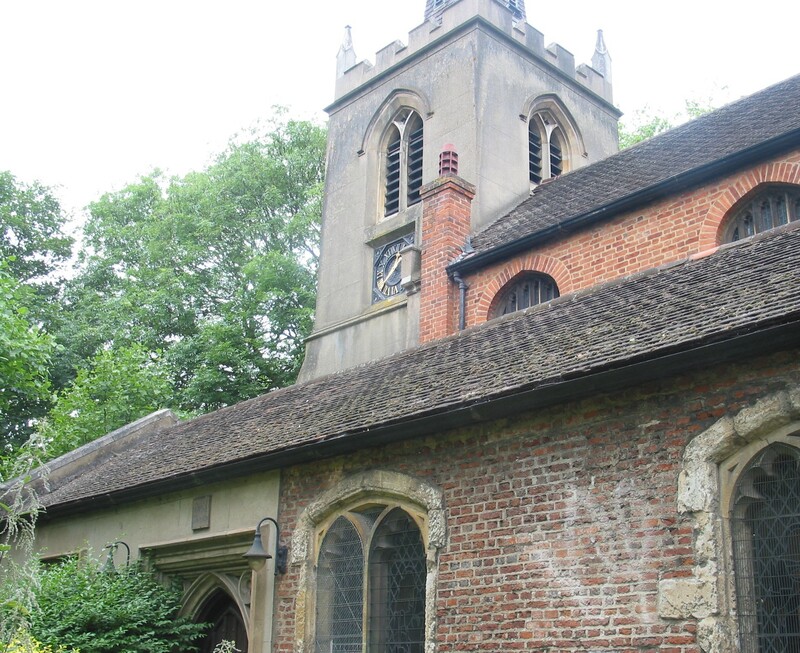 Sotherton died on 12 September 1819 in Kentish Town, and is buried with his wife Hannah and grand daughter Mary Sudlow at Bunhill Fields Burial Ground. The death duty registers show that he died intestate – unfortunately for family historians. (Death Duty Register IR27. Register October 1819, p. 10 Ref: Vol 2, Folio 392. IR27_28_018) Administration was to his oldest son by his first marriage, about whom we will hear in later blogs: John Backler, 19 Golden Square, Westminster. A touching endnote was the application by John to the Court of Assistants on the 26th of October 1819, ‘soliciting the Benevolence [of the Court] in favor of two daughters of the late Mr Backler and the same having been read and taken into consideration, Resolved that the sum of Fifty Pounds be given to Frances Backler [1779-1833] and Anna [Hannah] Backler [1780-1870], daughters of the late Mr. Sotherton Backler in equal shares between them. On 21 December 1819, the Court Minutes note that letters of thanks were received from both daughters and John Backler. And there ends the direct association of the Backler family with the Society of Apothecaries. 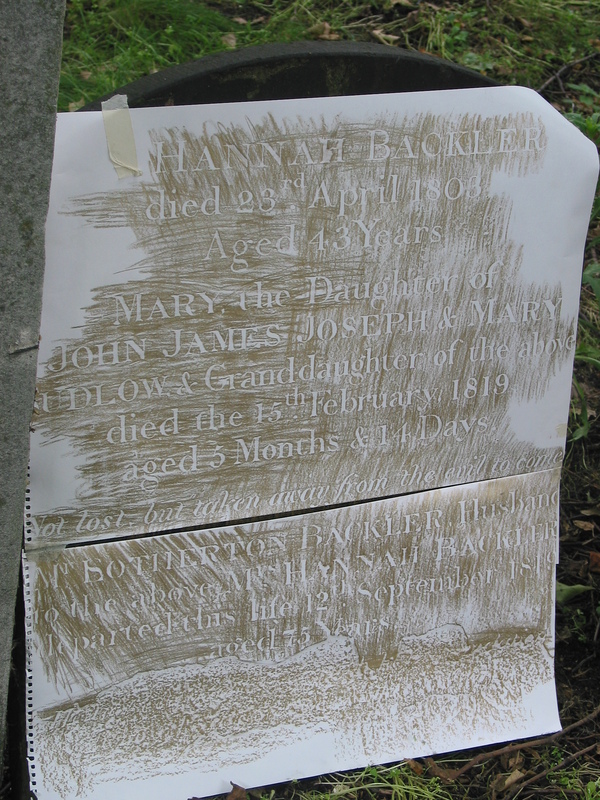 In subsequent blogs we will first trace the life and times of the two apothecary sons of Sotherton – the above-named John Backler, and his half-brother (my 3x great grandfather), Samuel Backler. We will then look at other descendants of Sotherton Backler.